Stefanie Brimacomb: EDTECH Learning Log | Learning. Doing. Growing. The “Owl” is a familiar friend that is reminiscent of my dog-eared 5th edition Bedford Handbook (1998). Like the handbook, Owl is organized into color-coded topics for research and writing.Another similarity is the structure of the content. Unlike the written text, the OWL’s search feature quickly points me to a writing topic. I frequently refer to the site because of its intuitive navigation, quick loading pages, and reliable content. Purdue has long been recognized as a top research school. Their Owl online writing lab has been available since the early “gopher” years of the internet. I first became aware of the site in 1997, but it was available even earlier, according to the site. I referred to it regularly during my first Master’s Degree (2000-2001) and continue to do so. Despite its longevity, the site is updated and current (2013). The appearance of the site has stayed consistent, with incremental changes on the backend keeping it clean and organized. One aspect that lends credibility is that the articles are dated and contributors are cited. I expect to continue to use OWL as I pursue my doctoral degree, and will continue eto recommend it to others. The NAID site is a good example of a government site that targets a specific audience. For those who may have specialized needs in science and healthcare technical writing, I found the NIH website informative, current (within past six months), and relevant. The site appears to be written for a professional audience, specifically in the health care industry. The pages loaded quickly and are organized in an aesthetic manner. The grammar and format are correct and readability is enhanced by the sans serif font. I found the color palatte also lends to readability as it was a dark on light approach. One factor that reduced readability was the site’s extensive use of hyperlinks. On the opening page, nearly every other line is a hyperlink to an explanation or further detail, with some links locked for NAID staff only. I clearly remember 1972. I am 10 years old, sitting in my fourth grade classroom listening to my much-loved teacher talking us through time – taking us on a journey of what then seemed to be fantasy. He spoke of when we were “grown-ups” that we would be able to see each other on TV while talking on our telephone. He said that we would be able to travel without going anywhere. The man was a visionary. Today, the phone talks to me! I can visit the sights of Singapore and hold a life-like Koi pond in the palm of my hand! I have the pleasure to not only see his description held true, but I have also been bestowed the honor and responsibility for pushing the technology forward! I don’t know how much further I will grow in the app development. This course took me out of my comfort zone and challenged me to rise above technical glitches and create something of benefit. But understanding how the technology works gives me impetus to take the students in my classroom on a visionary journey of what can be…in their future. This app design has been an intriguing challenge that fits right in to my life of predicaments and situations. I switched smart phone platforms for this course and have struggled with something akin to regret these past few months. An accomplished iOS user, I feel clumsy and frustrated with the Android, but I persist in my overcoming this obstacle. Last week I determined to get my apps organized into folders. I was successful, but in doing so, I inadvertently changed some setting within my Android that has prevented me from connecting (blocks editor does not see my phone). 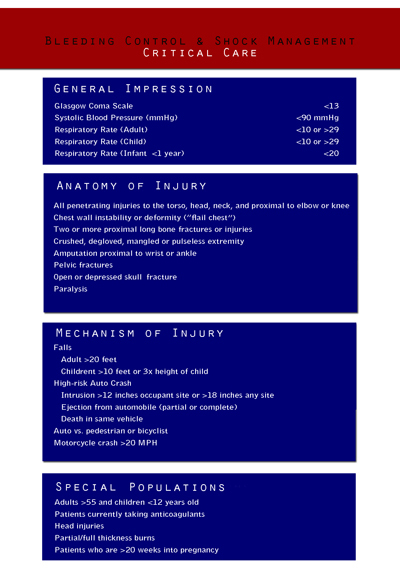 I plan for my app to be used by EMT’s on the ambulance or on scene. They will enter patient information that can be sent via SMS to our local ER prior to our arrival. We have to be cautious about providing a patient’s name over our radio communications, but there are several “hot spots” during our transport that an SMS message can be sent prior to our arrival (we have a minimum 45 minute transport). I designed the app so that the user will interact via text box entries, check boxes, gps positioning. and SMS messaging. The environment has varied lighting, so I avoided the use of color, choosing a neutral dark gray and white for the primary screens. I like being able to drag and drop functions in the Component Designer. It gives me an opportunity to play with the layout. The file size constraint is a potential setback. I am worried that as my app continues to grow, the size might get too big, so I have been resizing the photos in Photoshop to stay within the 5MB limit. I have frequent problems launching the blocks editor and am wondering why at this late date it is beginning to give me problems. The activity for white space clarified my vision of the course appearance. This portion of the assignment solidifies the main tenets of the activities, so I decided that keeping it simple and clean reinforces what my students are learning in the course’s printed materials and face to face skills practice. I allowed a generous amount of white space around the text to help the readers access the more “personally relevant” information (p. 274), and I placed the navigation buttons on opposing sides of the page to create a symmetrical appearance and help to balance the page (p. 275). Initially, I kept the circle that I had developed previously intact. My reviewer daughter suggested that I somehow emphasize the step I am on in the diagram, so I enlarged the yellow quadrant and agreed with her opinion. I will keep her change. 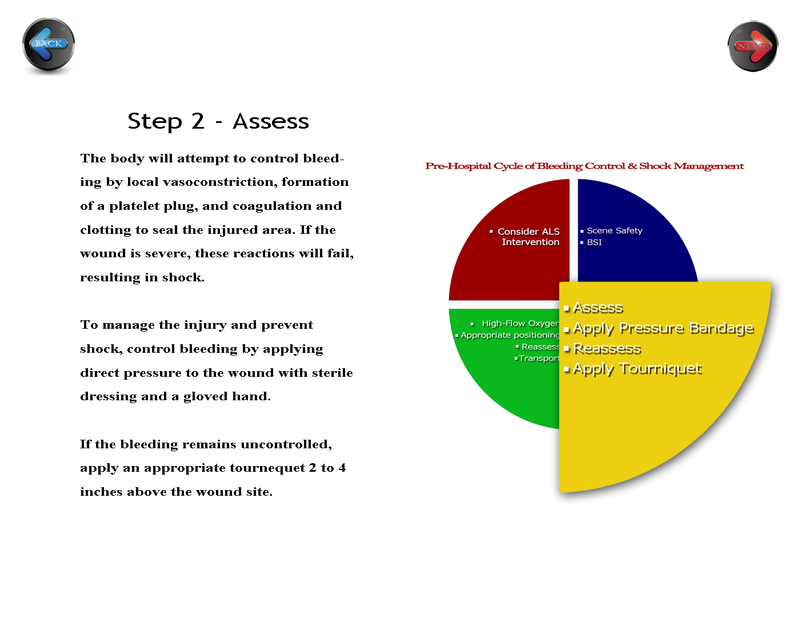 I might also change the “Step 2 – Assessment” position to the center to further balance the white space. After reading about the relationships between organization and learning, a looked over print and web learning material for both good and poor examples of Lohr’s principle of organization. The thought process behind developing a learning site surprised me. I realized that in fact, most of the process goes on in the head and on the design pad. 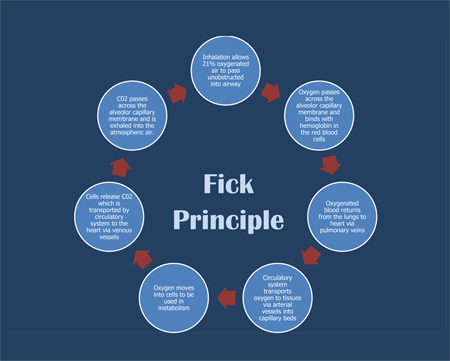 This chart represents the Fick Principle or the metabolism of oxygen, and provides a clear understanding of the interaction between what we term as the ABCs – Airway, Breathing, and Circulation. We need oxygen to live at the most basic cellular level. Oxygen is our primary fuel, and our bloodstream is the transport for that fuel to become metabolized. I chose the shapes because they represent molecules of oxygen or carbon dioxide. The red arrows symbolize the blood stream that transports the oxygen. I used a circular model to emphasize the circulatory nature of the cycle with the inhalation situated at the top and moving in a clockwise pattern as common to western culture and the thick arrows suggest a strong relationship between each action (p 128) – if any part of this chain is broken, the cycle becomes incomplete and the human body systems begin an attempt to compensate for the loss. This compensation is known as “shock.” I placed the beginning of the cycle at the top-most position, knowing that my learners are used to a left-right reading order (p. 135). But I will change it to add a slightly larger circle to more clearly define where to begin the cycle. My adult learners are often fatigued when they come to my evening classes. Despite thier lack of energy, I need for them to be alert. To provide an energy boost and give them some mental stimulus, I choose to use patriotic red, white, and blue color scheme (p. 265). Not only does each color stimulate their senses, each color represents an aspect of pre-hospital care that few see. Red represents blood, blue represents courage, and white represents cleanliness or purity. I chose hues with contrasting values – the bright (high intensity) red and the deeper (lower intensity) blue. 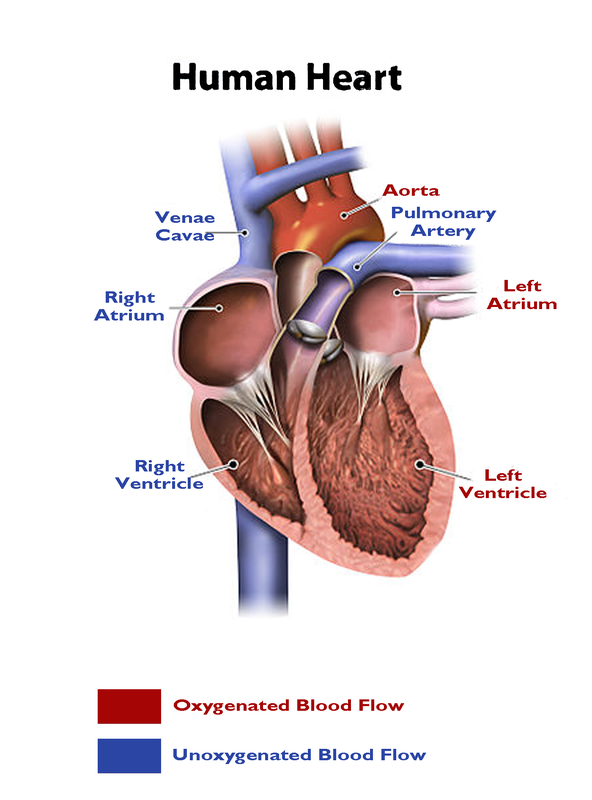 My assignment is a cardiac label that will be used to indicate blood flow, identify electrical impulse areas, and identify structures of the heart. For a representation of reality (p.254), I chose to use blue font to represent the unoxygenated blood returning from the peripheral systems. I then chose to use red to indicate oxygenated blood flow. 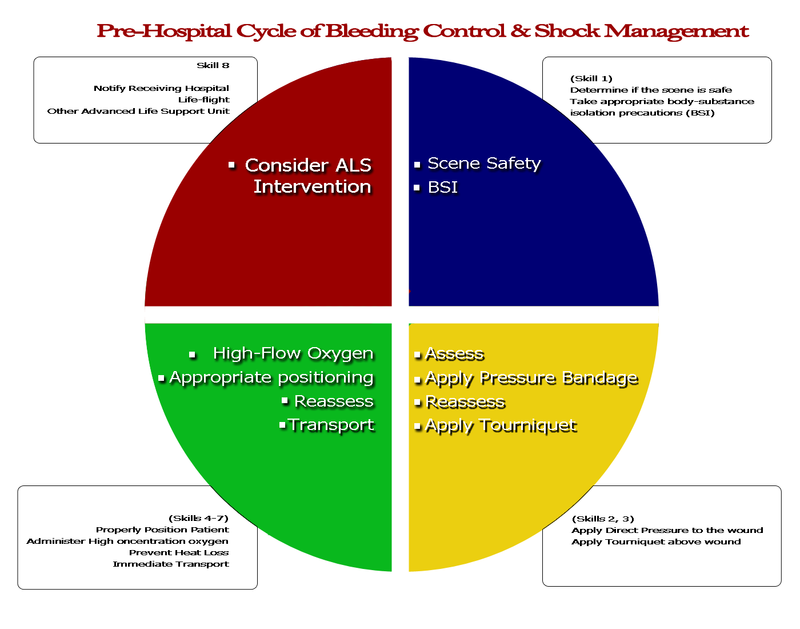 There are many factors to providing critical prehospital care. EMTs have to know how to determine if a patient is in immediate need of advanced care. The students taking this course will refer to this condensed chart which follows Lohr’s three C’s. There is a lot to remember in this section, so I concentrated a lot of information in one spot. In doing so, I also designed it to be concise and concrete with the white text dominating the field. I initially had the blue text fields extending out to the edge of the page, but decided to increase the white ground a bit to balance the high contrast of the blue and red after my reviewer complained that it “hurt his eyes.” I decided the problem was one in which the figure and ground competed (p. 102). When I reduced the width of the blue, I found that the text was enhanced by the white space around the blue text box. I analyzed the figure to see if I had unintentionally created a visual conflict. Originally, I had. The blue textboxes made the graphic look like a US Navy add with the blue and white “stripes” creating a 1+1=3 phenomenon (p. 100). My reviewer’s complaint told me that the figure and ground were causing visual conflict. The revision is much better – allowing the learner to “focus easily and quickly on [the] key message.” (p. 105). Overall, I am pleased with this part of my project. I used the same colors as prior projects to begin developing a color theme of red, white, and blue to match that of our ambulance service. It will work because it is easy to read and put into a logical format. These are not cardinal elements, so leaving them unnumbered helps to reduce the tendency to rank the elements. Lohr, L. (2008). Creating graphics for learning and performance: Lessons in visual literacy. (Second.) Upper Saddle River, NJ: Pearson Education, Inc.